The quest to transmit power without wires has been something people have been working on since centuries and obviously it not science fiction anymore, people have come up with different ways to transmit power wirelessly. We wrote about Wirticity back in 2010 which gained a lot of media attention back then. Back in 2009 a Seattle-based company by the name 'LaserMotive' specializing in laser power beaming proved to be the only successful entrant and winner of the NASA-sponsored Power Beaming Challenge. The idea of laser power is pretty simple. Just like a photovoltaic cell (solar cell) produces electricity from sun light, Laser power beaming acts in the same way. A powerful laser beam is used to carry energy over distances; this energy in the form of light and heat can be converted into electricity by using photovoltaic cells. This enables to transfer power wirelessly over distances and can be consider a more practical efficient and cost effective way compared to other wireless power transmission methods available. To get into the details you can check out this Laser power beaming fact sheet. So now that we know about laser power beaming, the idea can be used for a wide variety of applications, only your imagination is the limit. Although there are a lot of safety and efficiency factors involved with makes it difficult to use over existing electric power grid, we wont get into that in this post. You can always leave a question or opinion in the comments. Now in the modern warfare era of Drones, UAVs and UAS (unmanned ariel systems), endurance is one of the major challenges faced by UAV designers and developers. Battery based UAVs are silent but poor at endurance. Conventional fuel based UAVs have better endurance but they are very noisy and are difficult to use where you require to fly at low altitudes and small areas. So the application of laser power beaming seems to be the best solution. Lockheed in Collaboration with LaserMotive have come up with just that. The platform selected for testing is the Lockheed Martin Skunk Works "Stalker" UAV. 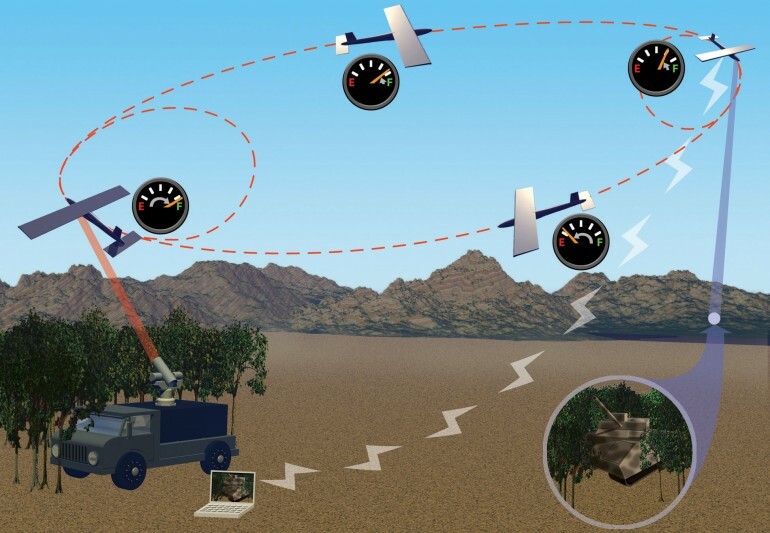 The testing team modifed the Stalker UAV to incorporate a Power Link system developed by Laser Motive. I think the picture pretty much explains it all, a powerful laser beam carries energy to the UAV that's over a distance, this is used to power the UAV. Beam powered UAVs can also operate far away from the beaming station through use of onboard energy storage like batteries. As a result UAVs can remain airborne indefinitely by regularly returning to the area near a beaming station to recharge its batteries. The use of laser power beam has resulted to a whopping 2400% increase in flight duration. The Stalker UAV successfully stayed air borne for 48 hour without any stop. There are a wide variety of applications this could be used, it could be also used to power low level satellites also called aerosat to provide catering for various needs. The company is even working on systems to beam power from the Earth’s surface to satellites and even the Moon. What is the power source is a Satellite , which in-turn is being charged by solar power ?